We’ve been flying a lot of short hops around Europe. EasyJet is our favorite and they are usually very dependable but they had a problem getting a fuel truck to the plane in Milan and when it was all over, we arrived to the airport at Malaga close to 2 hours late. By the time we got to our rental apartment in Estepona on the Costa Del Sol, it was close to 12midnight. We had just enough time to drop the bags and head on over to the nearest hotel, the Grand Hotel Elba Estepona a few hundred feet away. We sat on the piano bar deck, and listened to waves slapping the shore while we enjoyed a few cold beers and iced campari and potato chips. They closed the bar around 1am and kicked us out. The next morning we awoke to the sounds of the waved crashing against the beach that was less than 100′ from the bedroom window. This is a really great apartment on Arena (Spanish for sand) Beach in Estepona. There are two spacious bedrooms, two large bathrooms, a fully equipped kitchen, a large terrace overlooking the beach and Mediterranean sea. There is a good washing machine and really fast, non-stop Internet. 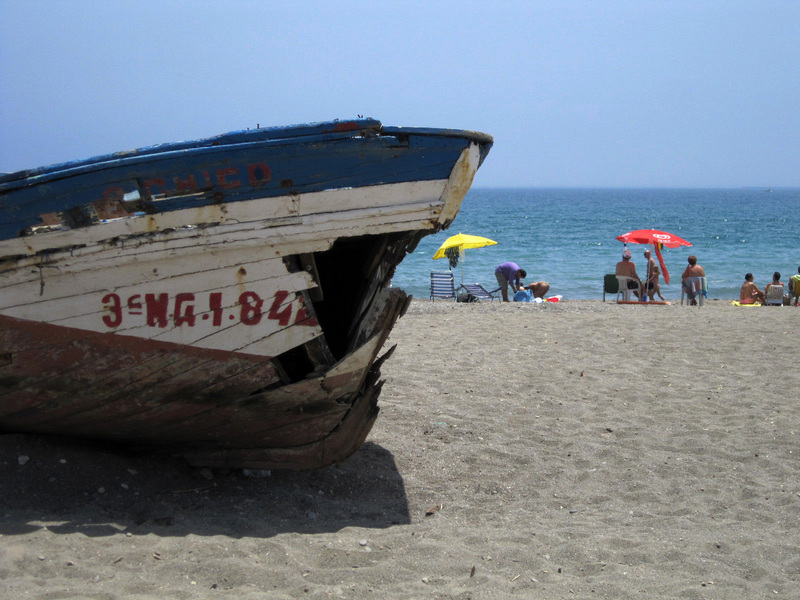 If you’re looking for an apartment on the Costa del Sol, I highly recommend this one. The owner, Vicky Churchill lives in the UK. This is her holiday home. she keeps it in really good condition and we were very happy to find it. Arena Beach is technically located in the town of Estepona, once a small fishing village, now a big fishing town with a population of 60,000, probably twice that much during the summer months. The 23km of sandy beach is an attraction for people from all over the world. 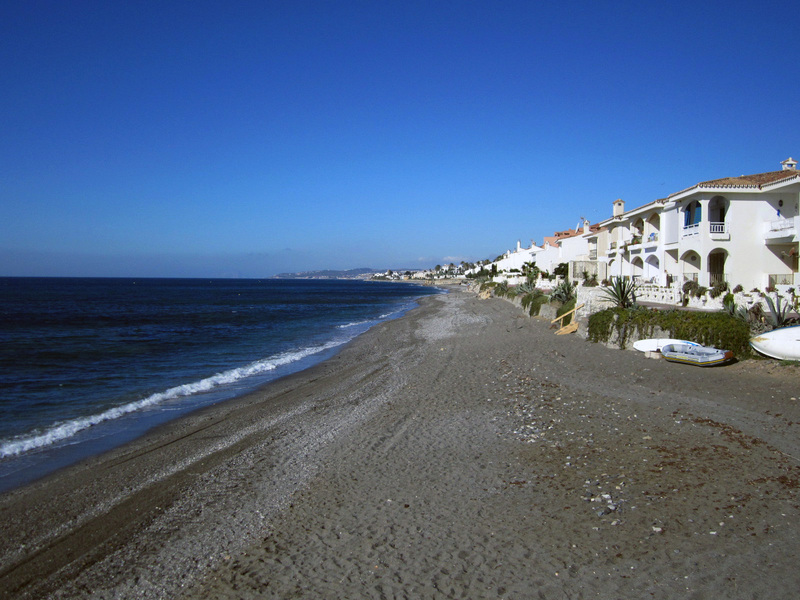 Estepona grew up after the big urbanization of neighboring Marbella got too crowded. We stayed in Marbella a few years ago. It’s a lot more relaxed here. In the 1990, the Walt Disney Corporation was very serious about making Estepona the site of EuroDisney, but in the end the French managed to convince them to build the park outside of Paris, a location that was probably better for Disney and a lot better for us here in Estepona. 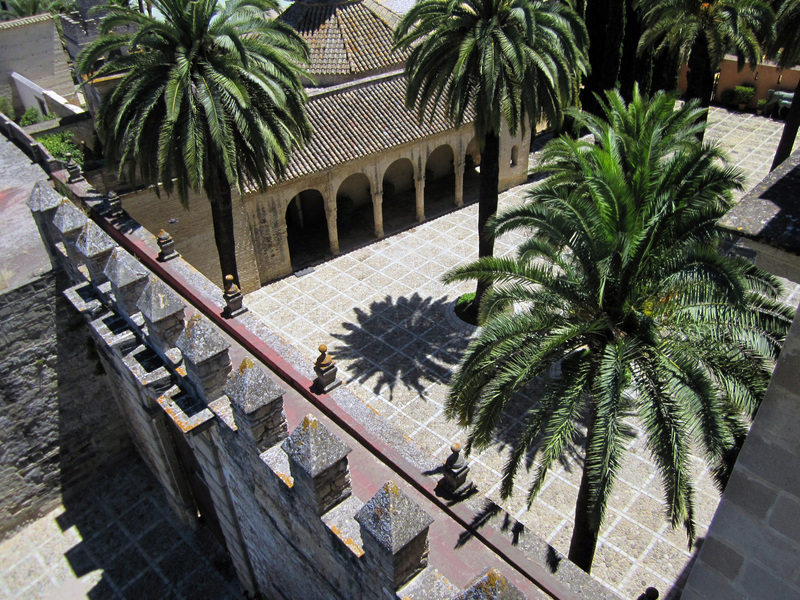 The area has the usual Andalusian history, Moorish invasion and occupation, Christian reclamation in the 15th century. There are remnants of the old times on the coast with old pirate lookout towers and abandoned crumbling fortresses but these days most of the Costa Del Sol is filled with what is known as urbinizacion, condo developments and beautiful ports with boat slips and restaurants. 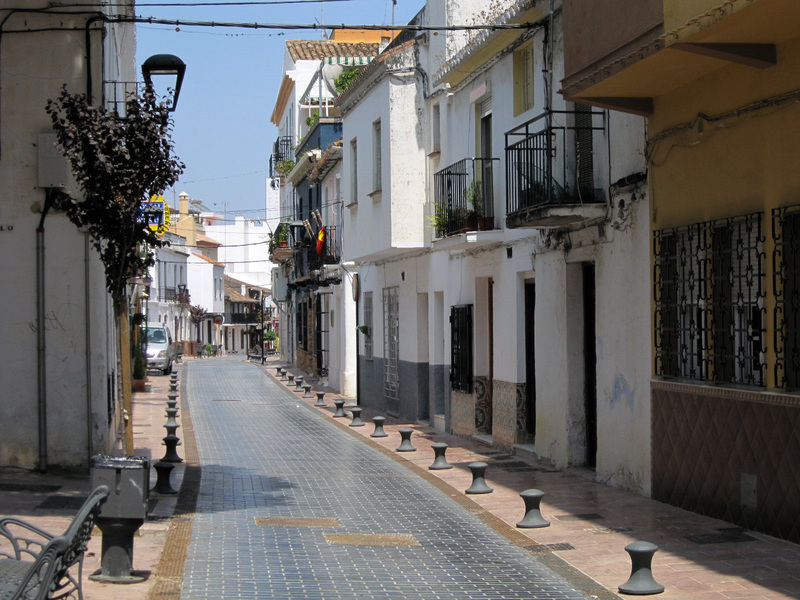 In the heart of old Estepona town is a quaint stroll through the old streets that close down everyday from 12:30p – 5p for the long Spanish siesta. It’s too hot during the day to do anything but sleep. The streets don’t really see life again till way after 10pm. Around 5pm everyone hits the beach for cocktails, strolls and snacks along the beach. Boats trolling for sardines during the days have brought the catch in around 5pm the beach is loaded with beach pits grilling the fresh catch for bar bites. 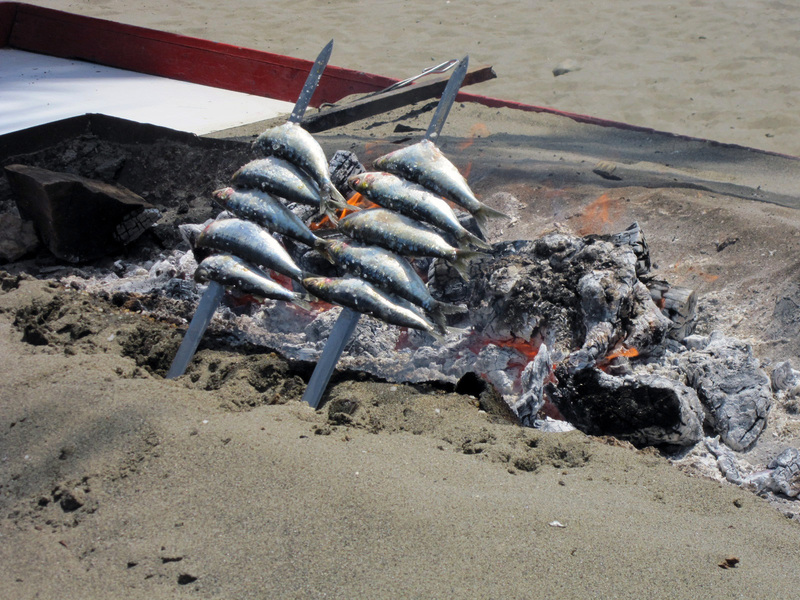 A cold beer and a warm sardine is the perfect way to bring in the evening. At the other end of town is the Bullfighting Ring (every town worth it’s reputation has one) and the port, where fishing boats still come in every morning with their catch, the restaurants troll for diners at night. Sunday is a big outdoor market at the Port. 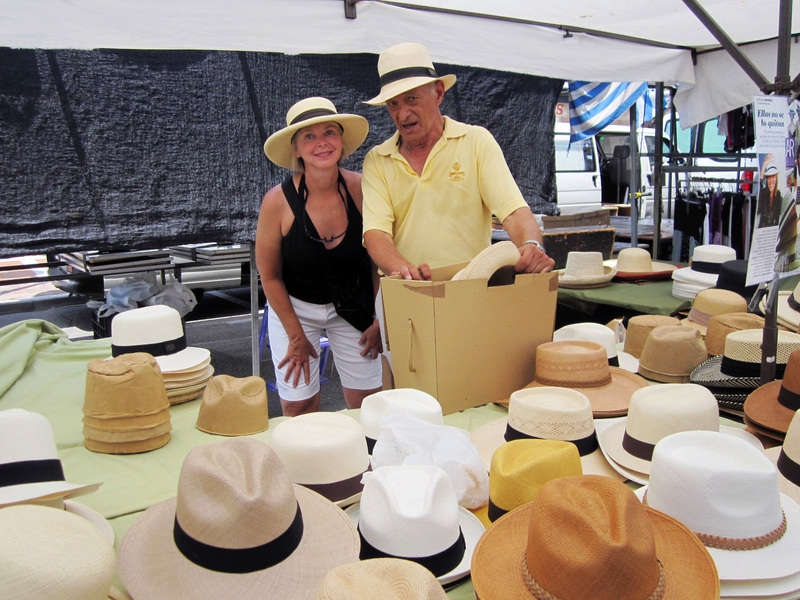 It’s the usual handicrafts market but we managed to find the authentic Panama hat table (the hats are traditionally made in Ecuador). We got a 20-minute lecture on Panama Hats and why Sean Connery looks like a vegetable wearing his Borsolino/Charlie Chan hat. Gretchen looks fabulous in her new Plantation style (authentico) Panama. From our apartment on Arenal Beach it’s about 130 km northwest to Jerez de la Frontera, the fifth largest city in Andalusia, which doesn’t sound like a lot but it does have a substantial population of 206,000 people. Most of the old central city is designated pedestrian zone, which was great while we were walking but not so great when you’re walking but not so great when you’re trying to get in or out of town. The looks from the locals as we drove the wrong way down small pedestrian streets were priceless. The fame of Jerez lies with its Andalusian horses, Flamenco dancing and the famous fortified wine. We call it Sherry. They call it Jerez. Actually, only the English speakers of the world are the only ones who call it Sherry because the English just have to anglicize everything they like. For Spain, Portugal, Italy, France it’s Xeres (pronounced hair-reth, of hair-res). The name goes back to the Phoenician settlement, Xeres. Over the years the name Xerez and Jerez became synonymous with the protected Domain of Origin stamp. Any wine named Jerez, Xeres or Sherry and must come from this area. Jerez (Sherry) is basically white wine (from Palomino, Pedro Ximenez or Moscatel grapes) fortified with brandy. Fortified wines last a lot longer and were a favorite of sailors back in the 15th and 16th centuries. Columbus traveled with casks of sherry on his voyage to the new world. Magellan supposedly spent more money on sherry than weapons when he prepared his ships to sail around the world. After Francis Drake and his pirates sacked Cadiz, he brought 2,900 barrels back home to London. The English were hooked. By the 17th century, it was the most popular alcoholic drink in Europe. The types range from the lighter Fino to Amontillado the darker Oloroso. 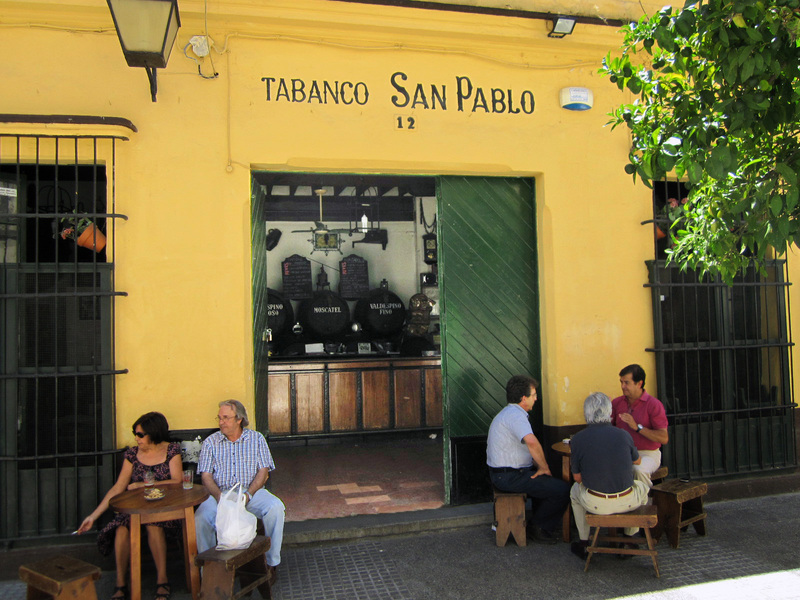 We got lost in the old Barrio San Miguel and stumbled upon the very famous sherry bar, Tabanco San Pablo. We knew it was famous because as we were inside the local news station was airing a story on the bar and the owner Jesus Munoz, the same guy who served us a few ice-cold glasses of the Oloroso. Yes, it was quite tasty and packed a powerful buzz. Jerez is filled with all the world famous Jerez (sherry) bodegas from Sandeman to Harvey’s Bristol cream. The biggest bodega however is Tio Pepe, the largest sherry house in Europe. Unfortunately, we never made to the tour. It was one of those decisions I regretted later but now we a reason to go back. Mostly I wanted to see the famous drunken mice bouncing off the casks and the famous Ratonero Bodeguero Andaluz (a rat terrier that kind of looks like a Jack Russell terrier) bred to chase after them. I can’t believe we didn’t stop in. Fortified wines do come from many countries. 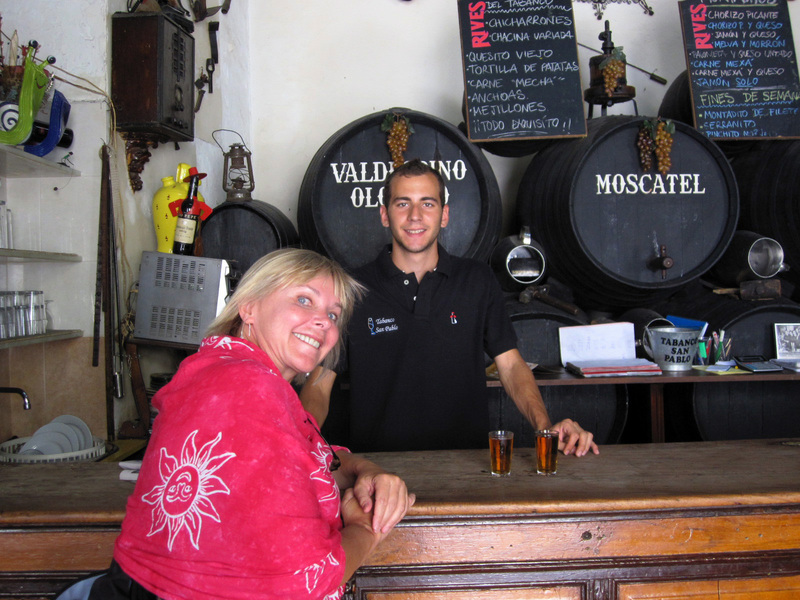 Sherry and Madeira wines come from Spain, Port wine from Portugal and Marsala and Vermouth from Italy. They are classic wines used for sipping and cooking. In America, we also have fortified wines; MD 20/20, Thunderbird, Wild Irish Rose, Night Train and a few others. They are mostly used to keep poor alcoholics asleep on the sidewalks of our cities. The Equestrian school was another place we didn’t visit. It’s the second most famous in Europe. The first is the Spanish School in Vienna, where the famed Lipizzaner Stallions were originally bred from Andalusian stock. The art of fine horsemanship and dressage has been associated with the Spanish for a long time, especially with Andalusian and Arab horses. They’ve been a favorite of the Royalty and Military leaders from the time of the Carthaginians to the Romans, Moors, Spanish and eventually the entire known world. What we did see in Jerez though was the old Moorish Alcazar, the accent is on the second syllable by the way, Alcazar. 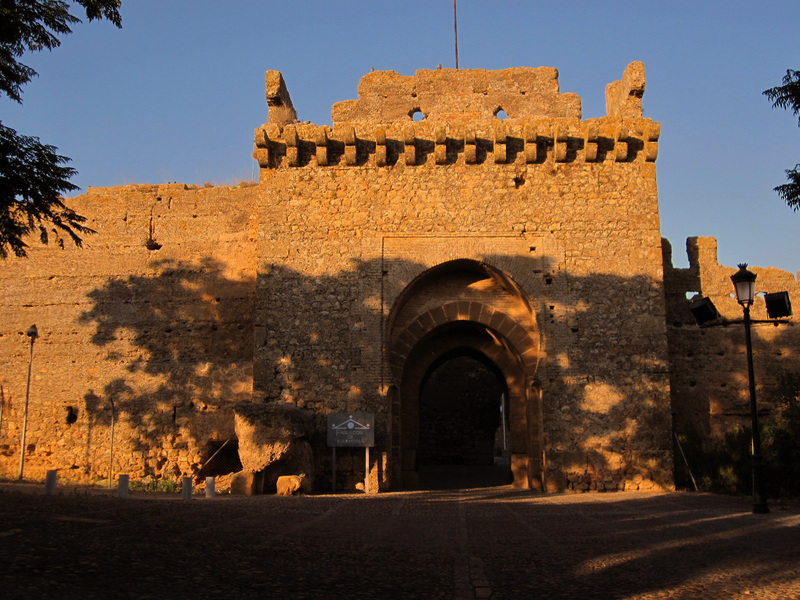 This 11th century Moorish fortress is in great condition although we don’t know if it was well maintained or restored. The minaret was turned into a bell tower when the Christians claimed it in the 1264. The Moorish baths might be the most complete 11th century Arab baths we’ve ever seen. All three chambers (hot, warm and cool) are still well defined and could easily be restored to work again. 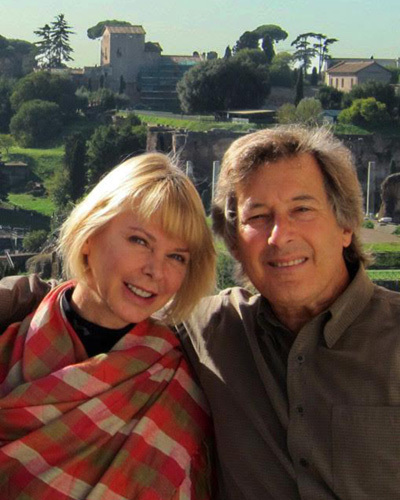 The gardens are lush, filled with cooling pools and olive trees. The peaceful small mosque is just the right size for a small family. A couple of old olive presses added in the 17th or 18th century are also on display. One was used to make olive paste, the other to press the oil. They were enormous and probably managed a large production in their day. The real treat here was the Camera Oscura, which has nothing to do with the fortress but we were glad it was there. The device gives a 360° view of the city from a pair of small magnifying lenses and a rotating mirror, projected through a periscope like tube onto a concave white bowl surface below. It’s the original Google earth, except that these images are living. You can see birds fly by, trees and laundry flutter in the wind. You can probably see what’s going on in the apartments across the street as well. So far, no one as of yet has complained of invasion of privacy. We left the beach and drove through the beautiful Serrania di Ronda Mountains past Ronda and into the area of Los Pueblos Blanco, the small white villages. It’s an easy decision what color to paint your house. At the exit to Carmona we ended up on a road more filled with more potholes than tar. We were in the country. We bounced around for the next 20km but finally arrived in this small city, once the summer home of King Pedro of Castile (Pedro the Cruel) in the 14th century. I wrote about Pedro in the 2009 Seville blog. Carmona was once an old Roman city. The remains of a Roman necropolis and an amphitheatre were discovered here in 1881. It’s also the site of one of the bloodiest battles of 9th century Arab against Arab when over 7,000 troops of the Abbasid Arabs from Bagdad attacked the 700 Umayyad Moors of Abd-ar Rahman held inside the fortress. More willing to die in a fight than starve inside the fortress, the mighty 700 of Abd-ar Rahman destroyed the Abbasids, cut off the heads of their leaders and sent them back to Mecca preserved in salt. It’s kind of like the the Alamo with a different ending. Carmona is one of those villages much easier to walk than to drive. The streets are really narrow. It’s a beautiful Andalusian town with a couple of Moorish fortress, a lot of Baroque churches, an archeology museum, the Roman Necropolis and a really beautiful Parador Hotel. 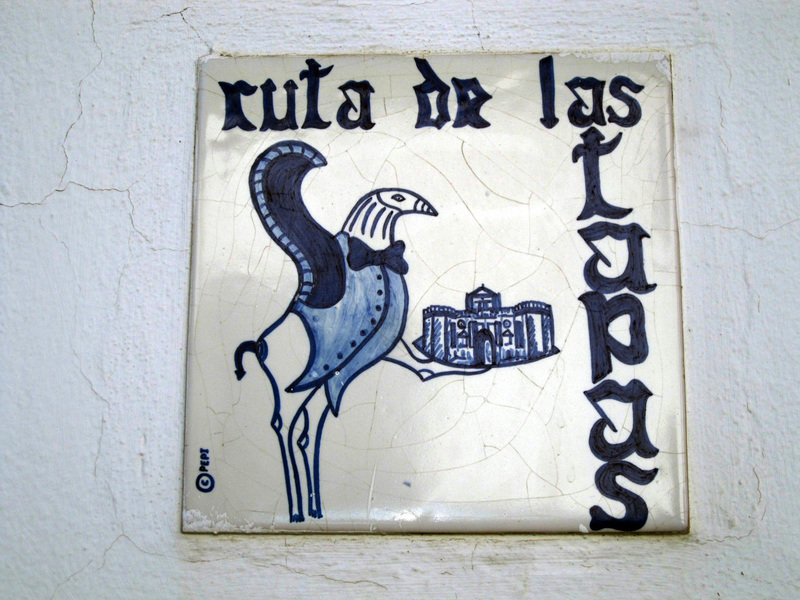 Adding to all of this is the “Ruta de las tapas”, a group of 17 local restaurants and tapas bars that have gained the right to bear the blue and white “route of the tapas” tile outside their restaurant as if it was a Michelin Star. We have no idea what it takes to get a blue tile, tapas obviously, but the places range from a hole in the wall bar to the grand dining hall of the Parador. With all this going on we thought it would be a great stop for a couple of days and it would have been it wasn’t so hot. We are in the frying pan of Spain. Average temperatures this time of year hover around 40°C (around 104°F). The only air movement is from the wings of the flies and they buzz by your head. The heat has driven the entire town inside. They don’t come back out till close to 10pm when it just starts to cool off. 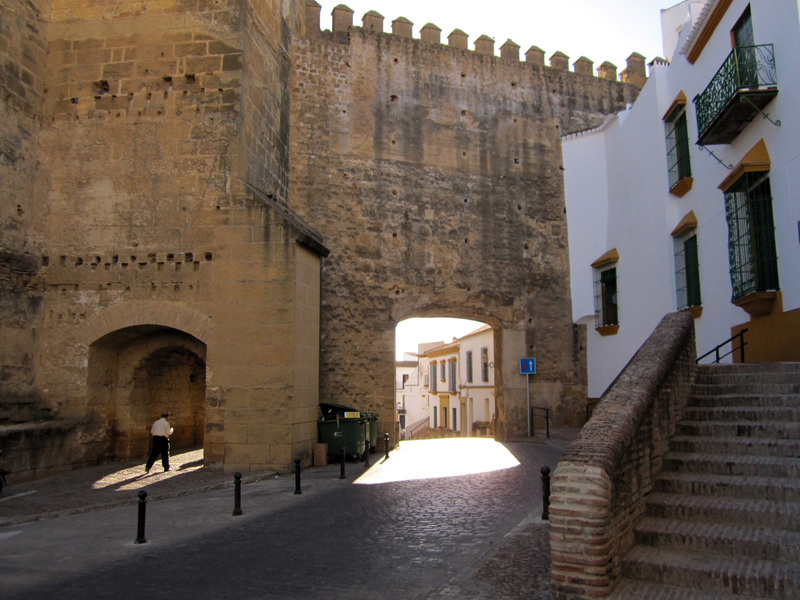 There are two Alcazars (Moorish Fortress/Palaces) in Carmona. Our hotel, the Alcazar del la Reina was neither of them. In looks like an old Patrician home that was converted into a hotel back in the 1970’s and supposedly renovated again a few years ago. The price of a room was very good, so inexpensive we sprang for the grand Suite Azul. The room was clean, the furniture was a reproduction of 1930’s style and there was a good Internet connection. We probably would have been happy there if the AC functioned better. The poor AC just couldn’t keep up with the demand from the heat. By the end of the stay we wished we booked a room in the Parador. We ventured out for dinner around 8:30p and finally stopped at a small relaxed bar called Taberna El Cubete with the coveted blue and white “Route of the Tapas” tile outside the door. Their specialty is “queso ardiente”, spicy deep fired cheese balls, but they were out of them. Instead we got a goat cheese cooked in peppery oil and some deep fried sardines (boquerones) with a mild Spanish style crème fraise. Next we walked over to the Parador of Carmona and watched the sprawling Vega with a couple of cold beers before walking down the street to Molino de la Romera, an old converted oil mill now another of the famous (blue tile) tapas restaurants. We had some salmorejo al estilo Cordobes (a Cordoba style gazpacho), espinacas al estilo de Carmona (spinach and chickpeas cooked in olive oil and garlic), some sweet aceitunas de las casa (Sevillian olives with chickpeas) and a big piece of veal entrecot or what the Spanish call “Capea”. It was an excellent meal.By 11:30pm we started walking back to the hotel and started hearing the voices of children and adults coming out. It was finally cooling down. We spent a lot of time in Cordoba in 2007 but we never got into the Alcazar de los Reyes Cristianos (Alcazar of the Christian Kings). Any excuse to come back here is worth it. Alcazar comes from the Arabic word Alqasr, or Palace. Although there are some remains of the Arab palace in the fortifications and the Arab baths, most of the fortress is from the 13th-15th-century Spanish Reconquista. 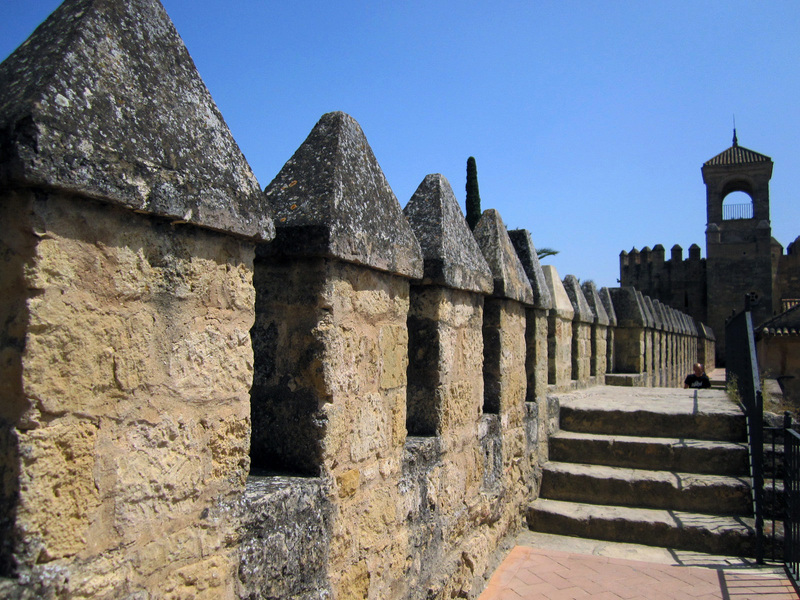 The Alcazar was one of the primary residences of Isabella and Ferdinand in the 15th century and, supposedly, it was inside of these stonewalls the details of the expedition to the new Americas were put into place. During the inquisition of 1482, purging Spain of all Arabs and Jews, the Alcazar was converted into interrogation and torture chambers. Boabdil, the last of the Moor Caliphs was imprisoned here in 1483. In 1810, Napoleon’s troops used the fortress as an Army garrison. It became a prison again until in the 1950’s. Now, it’s a €4 ticket (free on Fridays) for a walk around the parapet and a great view of the city. There are some old roman mosaic floors that were discovered in 1959 on display, but mostly it’s an hour of walking in some really great old history. After a bowl of cool salmorejo (Cordoba style gazpacho) and a stroll through the small shops around the old Jewish quarter (shops like these must have been here since the 10th century) we made our pilgrimage to the largest Mosque in Europe (well now converted into a Cathedral). The Mezquita is an enormous hall filled with giant architectural double arches supporting the soaring roof and over 850 columns of jasper, marble, granite and onyx from an old Roman Temple that support the arches. It’s one of those mouth open gaping experiences every time we come into this place. 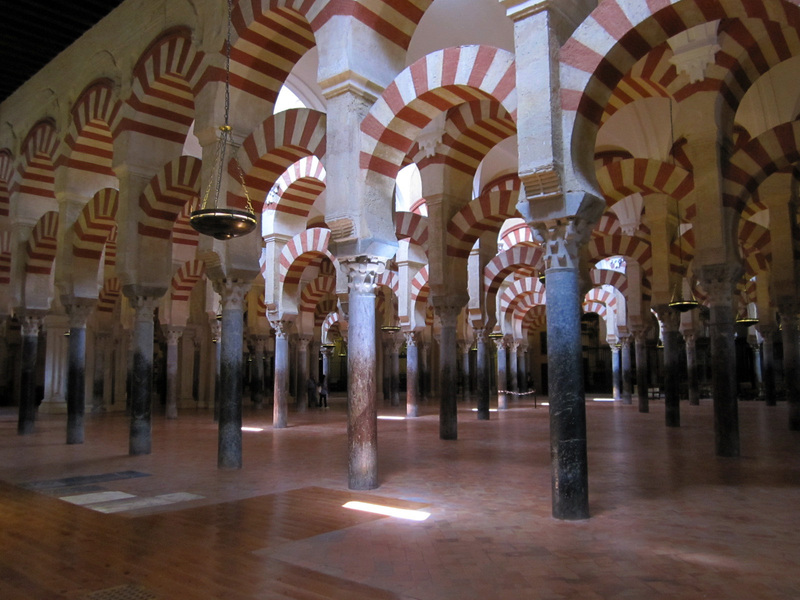 I wrote a lot about the Mezquita in our 2007 visit. In the center of the Mezquita is the Church, officially known as the Church of Assumption of the Virgin. It is a beautiful 15th century church but it just looks totally out of place in this peaceful Islamic prayer hall. But then if it weren’t for the conversion of the mosque into the cathedral, the whole building would have probably been torn down during the Inquisition of 1482. 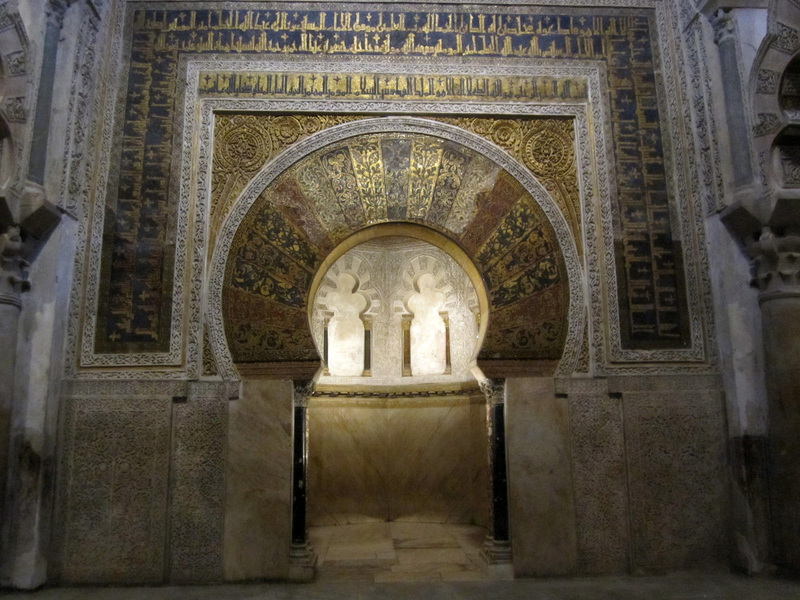 The Catholic reconquistas also left the Mirhab, the original niche of a mosque that point to the direction of Mecca. It’s not used anymore but it’s well lit and part of the history of the building. The Mirhab of the Mezquita has a pretty unusual history as well. Mecca is east-southeast of the Mirhab but the Mirhab actually points due south. The legend is that the builder of the original mosque, Abd-ar-Rahman, the Falcon of Andalus, directed the Mirhab to point towards Damascus instead of Mecca because the Umayyad Arabs (of which he was one) fled to Damascus from Mecca in 750 after political coup. Since Damascus was the new center of their kingdom, the Mirhab pointed to Damascus. 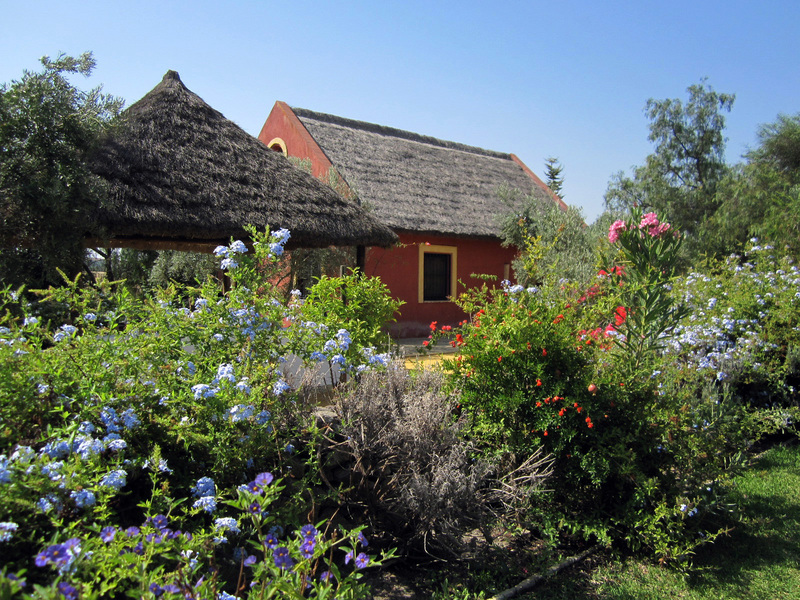 Our next hotel, the Hacienda de San Rafael is about 45 minutes south of Seville, on the outskirts of a small town called Las Cabezas de San Juan (Saint John’s Hills). It’s pretty flat except for the couple of Cabezas off in the distance. It’s really hot, there are lots of flies, and the rooms are built with sleeping lofts. Yes, hot air rises into the even hotter sleeping lofts. We were told that in this part of Spain you need three hands, one just to shoo away the flies. But insectos aside, and, even the air conditioning can’t keep up with the heat. The Hacienda and the grounds are really beautiful and relaxing. I just think July might not be the right time to come to here. I can imagine how ideal this property would be in late September/October or in May/June. There are three swimming pools, the staff is extremely attentive and we were upgraded to one of the small houses or “casitas” with a thatched“chozo” roof with a sleeping loft. Thatching a roof was common all over Europe over a thousand years ago, but they’re pretty rare these days. There is a lot of upkeep and of course, the fire concern, which is the main reason we don’t see anything older than the 16th century in cities like Paris and London. Let’s face it, when you have a city of thatched roofs, a city can burn up very fast. The roofs of the “Casitas” seem very Yucatan to me. I don’t know if the Spanish got the style from the new world or the new world got the style from the Spanish? It’s definitely an old art form and probably difficult to find a good chozo craftsman. We were told it’s a very restricted permit to build them because the thatching is protected. I’m also pretty sure you can’t build them in a very dense population. It’s quiet here, so quiet you can really notice what you don’t hear; cars, electricity, people. We are spending our days sitting under a open sided thatched cabana hut, shaded from the sun (but not the heat or the flies). Our breakfast of rolls, juice and coffee is brought to the cabana every morning. In the mornings it’s cooler outside than in the air conditioned Casita. During the day we lay by the pool, cool off in the water, write, read, and swat flies. The temperatures are soaring. It’s been about 47°C (117°F). It’s summertime in Spain. In the late afternoon/early evening we head north to Seville. We’ve been getting there around 6p-7p and the only people outside are the tourists. The temperature near the car park read 45°C (113°F) at 6pm. The Sevillianos know better. 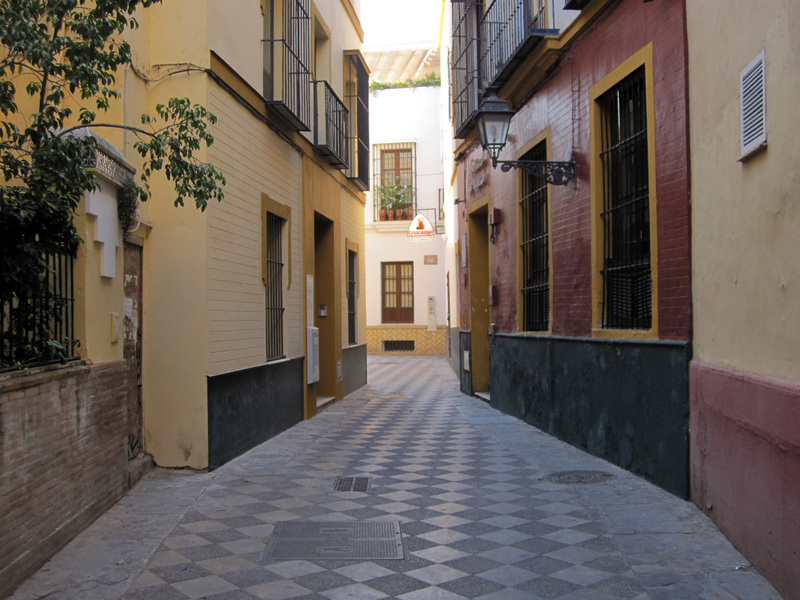 The small streets of the Barrio Santa Cruz are deserted. The car park is next to the Hotel Alfonso XIII, a grand Mudejar style hotel built for the 1929 Ibero-American Exposition. It’s now a Starwood property and it’s really impressive. It’s also less than a 10-minute walk to the Catedral, Alcazar, Giralda and the Barrio Santa Cruz. Most of the remains of the 1929 fair are in the Maria Luisa Park on the other side of the Hotel King Alfonso XIII. When they built this fair, they built it to last a long time and there are quite a few of the ’29 Fair buildings throughout the park. Some of them are now museums. The centerpiece is the fantastical Plaza de Espana. This was the showpiece of the fair. It’s sweeping arched faced has to be over ½ km wide, much too wide to get into one photo from my camera. Plaza de Espana is a mix of art deco-mudejar design. There are countless porticos, towers and tiled bridges that once straddled a man made pond, which was being renovated during our visit.. 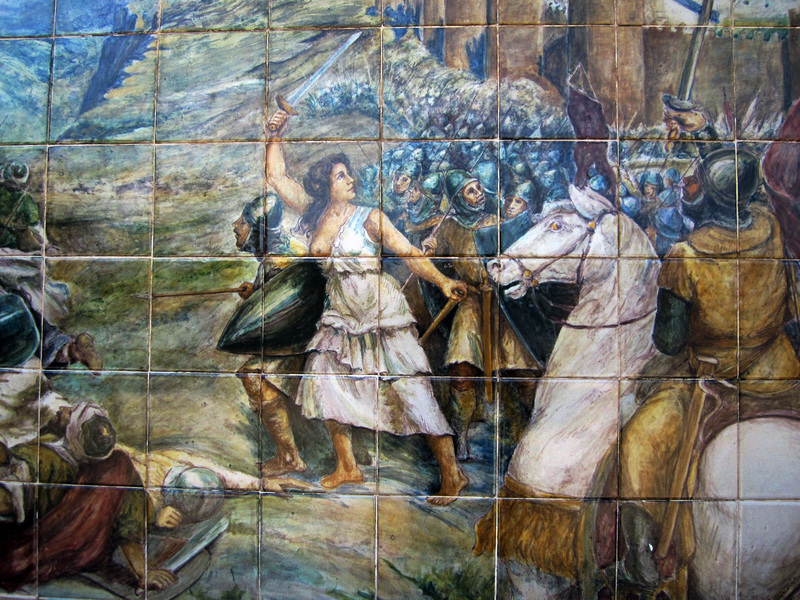 The lower section of the facade is covered with ceramic tile illustration/allegories of the provinces of Spain. The building is a wonderful backdrop of photographers. We saw them snapping off photos of themselves in front of their favorite tile province. It’s also been the backdrop for some great films. It was the Cairo British Army HQ in David Lean’s “Lawrence of Arabia” and the Naboo Palace in George Lucas’s Star Wars Episode II: Attack of the Clones. 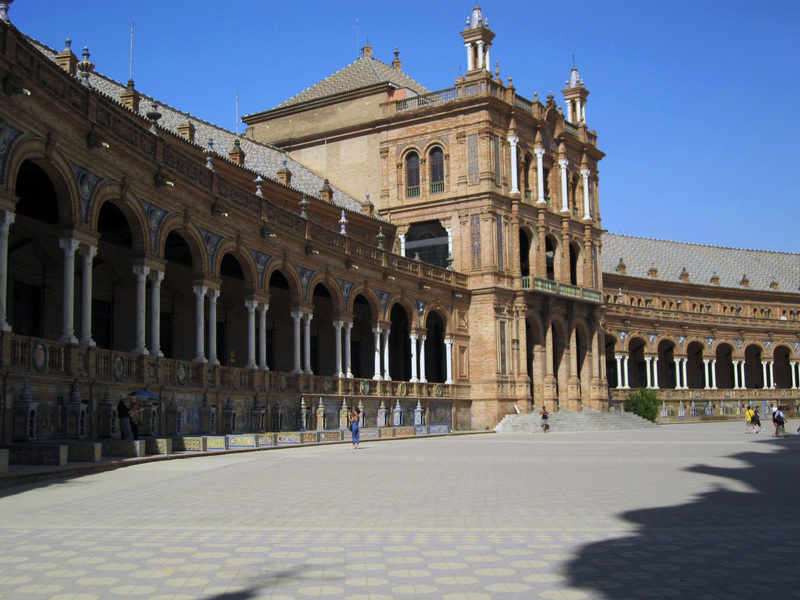 Seville was once the wealthiest city in all of Spain. Between 1504 and 1649 during the “Discovery of the Americas” years, the money kept coming in by the boatloads, but in 1649, the plague wiped out ½ the city. Seville didn’t really recover till the mid 1800’s. The Ibero-American Exposition in 1929 was going to put Seville back on the map. It did, but not in the way they planned. The 1929 Exposition was a major flop and almost bankrupted the city. For some bizarre reason, there was also a World’s Fair in Barcelona in 1929. Yes, Barcelona is also in Spain. Now that’s what I call really bad planning. How could they not know? We were here in Seville last year (2009). This year we came back to see the Plaza Espana, explore more of the small streets, take in some window shopping along the Calle Sierpes and check out the tapas bars. Tapas Bars make perfect sense in this heat. A cold glass of beer and a small taste is much better than a fill up. Seville is famous as one of the best tapas bar cities in Spain. In our few days in Seville, we sampled small plates from at least six tapas bars, ranging from pulpo a la Gallega (grilled octopus) to chupa chups (meatballs, cheese and ham), empinades de pollo (fried chicken), something called a Greek salad, Salmorejo (the Cordoba version of gazpacho), lomo a la cerveza (beef cooked in beer), pringa (shredded beef and cabbage on toast), batatas com anchovas ao vinagre (potatoes with fresh anchovies and vinegar), brochetas del pollo marroqui (Moroccan style chicken and onion skewers), bacalao ahumado (smoked cod), costillas a la miel (ribs in honey), pollo en adobo (chicken marinated in vinegar from Jerez) and habas con jamon (ham and white beans), calmares al a romana (deep fried calamari) and gambas al ajillo (shrimp in garlic sauce) to name a few. There were others I have no idea what they were. At the Bodeguita Cassablanca (our absolute favorite tapas experience) we were invited to join Jose and Vittoria at their table. Jose lived in the US for a couple of years and loved introducing us to all kinds of weird things to eat. They kept on coming. 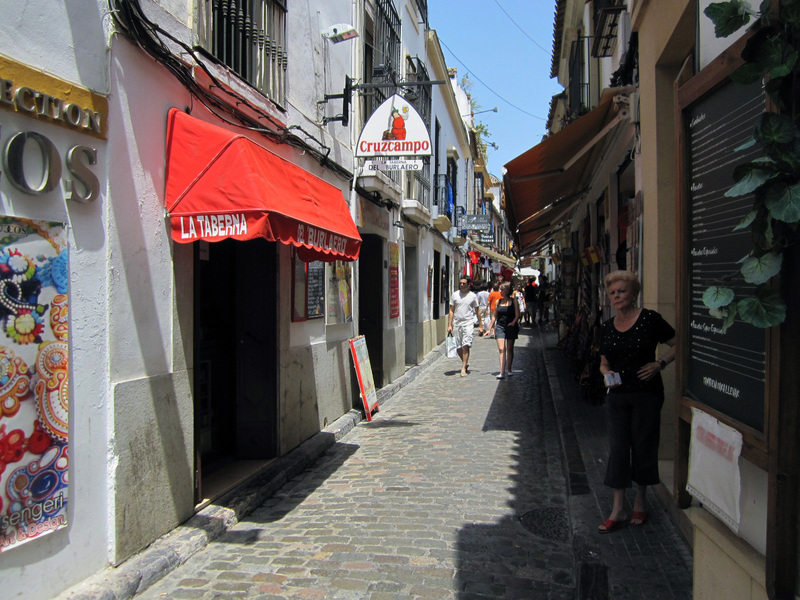 Cerveceria La Giralda – on Calle Mateos Gago 2, just off the main square by the Catedral and the Giralda tower. El Riconcillo – Calle Gerona 40, Seville, a 4 minute walk from the Hospes Las Casas Del Rey De Baez. This is a really beautiful step back into old Seville. The tapas bar is always crowded but you can also get a table in the dining room. It’s an amazing meal. 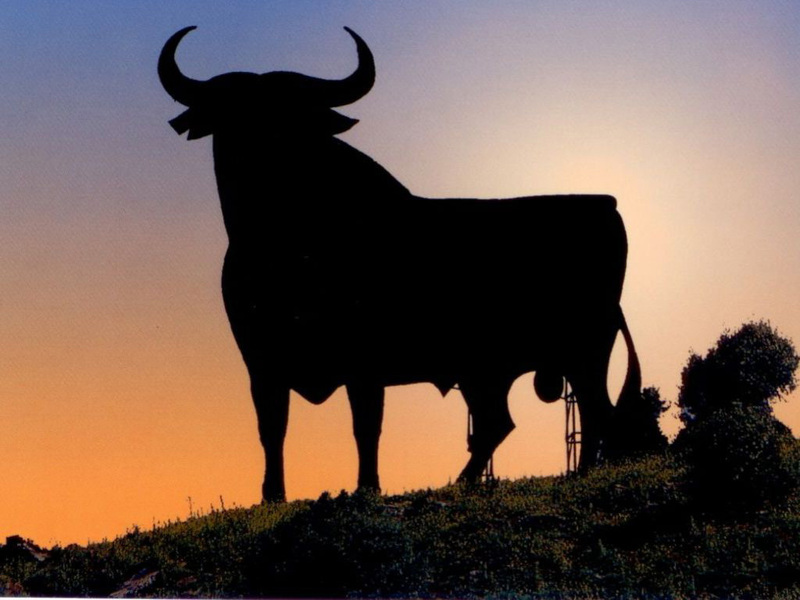 We love driving through Spain, there are amazing vistas, mountains ranges, white villages, old Moorish castles, old Spanish castles, large old roadside cafes and every once in a while you’re treated to a 50’ tall black bull silhouetted against the sky. There are currently 89 of these bulls around Spain. The image has kind of become the National Symbol. It originated in 1956 from the Osborne Sherry Company to advertise their Brandy de Jerez. In 1994, the Spanish government finally put an end to the large billboards and most of them came down but after support from some local groups the 89 that remain were saved from destruction.